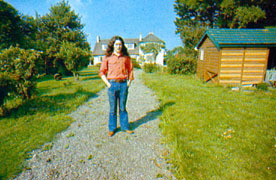 To all the readers of "Player"
I visited Rory Gallagher in his hometown of Cork, , where he spent a holiday a while after the festival in Germany. You can be at Cork airport an hour after leaving Heathrow in London, while watching beautiful sea-surrounded island, Ireland. The city of Cork is filled with a maritime atmosphere as well as friendliness typical of the Irish. I suppose the big difference in the taste of the Guinness beer between in England and Ireland stems from the water; the Guinness served in London is made from tap water, but in Ireland it is made from sweet mountain water, no wonder you can have the original Guinness only in this country. I arrived at the Cork airport around 10 in the morning and tried to make contact with Rory, but he was still asleep because he stayed up late last night. I made an appointment to come over to see him at noon, then I hung around the town sightseeing trying to kill time for a couple of hours. 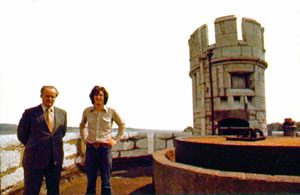 Rory's mother's place is about 5 minutes from the Cork airport, and a castle stands nearby. It is really nice place, the sea breeze through the window tastes nice as well. This castle was built around 159, facing the enemy from opposite shore of the river and sea. I've heard Rory used to play there when he was little and three years ago he had taken a movie there. "This castle was built in 16th century. Rory played there when he was little. The guy on the right is Rory's brother. He looks sort of like Rory." I reached his mother's place around twelve. Rory's brother and his mother met at the entrance, but Rory was still asleep. No wonder he would be really tired after big concert and totally relaxed after a long time from his home on the road. I really felt bad for waking him up, but asked his mother to do so . Waiting for him to appear, the three of us tried to listen to a new album - but this is not his new album, it's a solo album of violinist of ex-East of Eden. 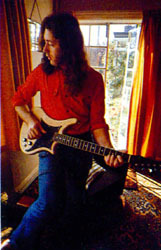 Rory had played slide guitar on one song . This album is filled with instrumental tunes and you can feel the big melancholy through the album that comes from typical Irish traditional songs. I got caught up with his slide guitar technique - his playing catches the theme so well - after listening for a long while. Rory appeared around one in the afternoon, I met him once before almost a year ago, then said hello to him for this great second meeting. He looked so fine, with enough sleep and completely in a relaxed mode, plus the bright Irish sunshine shining through the window made his face look healthy and feeling good. While I thought he would have started with a Guinness in his morning break, he did take coffee. I can imagine he was brought up with Irish coffee since he was little. After having coffee, he seems to get away from sleep completely and gets his brain clear, so I try to do the interview. I handed him a copy of our "Player" magazine and as well a number of additional Player magazines, then tried to explain to him about the interval announcement of the readers' poll (he was in 10th place in the rankings at that moment). We chatted in a friendly atmosphere. I was totally surprised by Rory. He was totally into looking at our magazine. Besides the fact that he can't understand Japanese, surprisingly he looked at the guitar of a guitarist in the pin-ups, and also looked at our other copies of Player magazine. He was totally into looking at the wiring diagram because it seemed to be the first time for to him to look at it (of course it is totally common to all guitar players all over the world! ) in the featured article on Fender and Gibson guitars. On the advertisement page of Guyatone guitars, he was totally thrilled to find his guitar model called "Marroly". He's interested not only in Guyatone guitars, he is interested in other Japanese guitars. Actually he did have lots of knowledge of other kinds of them. Because he takes the contact microphone for "Bug" of Ibanez on his Martin and Harmony acoustic guitar, also he puts some Ibanez parts on his electric guitar. Additionally, I have to add that he did join our readers' poll. 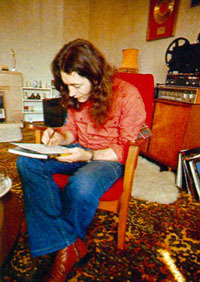 I put the copy of his poll of readers seat, it might be hard to read, most of his favorite guitarists are blues men like Muddy Waters, or American guitar hero like Robbie Robertson, I can't deny it is typical Rory Gallagher's taste. Then I tried to interview him, it will be on our November issue, hope you all readers can wait with much expectation! He did write our readers' poll. - they are his top five guitarists." 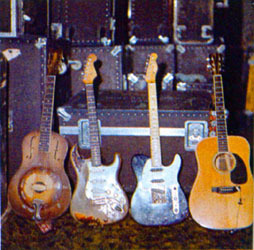 After the interview, he brought some of his guitars up to the room, but these guitars seemed to be different stock because his famous Stratocaster and Telecaster are in the storehouse in London. What grabbed my eye in his collection first was Marroly guitar of Guyatone. It is a re-released one with containing Rory's new idea. He had played a Guyatone guitar once before (he called it as "Gai-ya-tone" / we call it as "Gu-ya-tone") but at that moment it wasn't suited to his playing- He left it then, but he missed it dearly and was then almost desperate to get it again. When he came over to play in Japan, he tried to get it again, and asked around for it, even the maker, but sadly The Guyatone guitars weren't stocked anymore. Then they made a new model based on Rory's idea. It's one of his favorites. 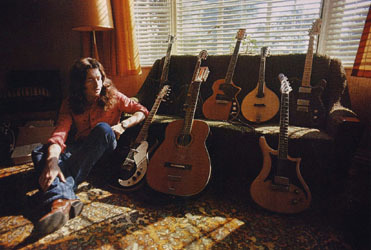 And also there was a Harmony's 12string guitar, a Yamaha guitar, an electric Mandolin made by Chris Eccleshall, an custom made guitar by Mr. Tomioka (Guyatone) (Rory said this guitar's tone and volume switches are really in a very good position to play), and Jimmy Page's favorite Danelectro, a Fender Telecaster deluxe. Try to imagine, if he brought his famous Stratocaster and National dobro guitar, you could see all of his guitars. All guitars are altered to his liking, and he tried to play each of them very carefully. 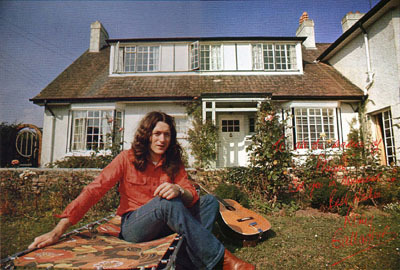 When the interview was over, we tried to leave his house, but he came out to the sunny garden with his Harmony 12string guitar in his hand. It was nice weather day. He had the complete look of one of those guitar freaked-common nice guys, you can find everywhere. When he stood behind the clear blue sky, a bit of lake flavored-sweet air and green glass in his garden, he looked totally different from a rock star who plays hard and energetically on the stage . What in the world gives this quiet, good young man has so much tough energy? 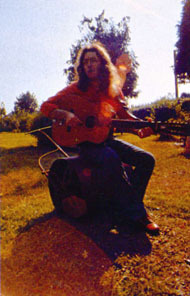 ...I wondered when I looked at Rory who sat on garden roller, playing a strange freakish instrumental number without any pause. He tried to strike a variety of poses for photo session, like standing in front of his house, playing with his dog, sitting in his brothers' car, a Jensen. At the moment he lives in Belgium, and he spends his private life there, but this is completely the first time showing his house in Cork off for press. And I never thought he might cooperate with my making the report as he is famous for hating to be photographed. But he didn't allow me to take picture of his mother because after his father's passing three years ago, he seemed to get totally nervous about his private life. "Rory spends a holiday a while after the festival in Germany. he enjoy spending holidays in a relaxed mood." 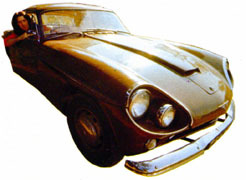 "Rory's brother's beloved car, a Jensen"
"Playing with his beloved dog. He seems to be tired a bit?" At almost 2 in the afternoon making my report was over. Sadly I declined their invitation to have dinner together because I had reserved my flight at three. I drove to the airport, but the check-in counter said they didn't know when they would fly, so I drove back to him and had dinner with him and his family. When I re-arrived at his house, he was still looking into our extra issue! While all the guitars I wanted to report on were not in his house in Cork, I did see THE Stratocaster at Rory's storage area of Chrysalis Record in London. I can MEET his four main guitars which are totally famous for his stage photo, (from left to right: National Dobro guitar, Stratocaster, Telecaster, Martin D-35) each of them are extraordinary powerful looking through heavy playing. I will do article on them on "Close up series" soon, just wait for a month! Rory will come over to play in this October, his third Japan tour. No doubt will see his full energetic playing in front of our eyes and ,of course, with his Strat! My thanks to Reiko Schnetzer for connecting me to Nero's Japanese Tribute page maybe I will (check it out) and to Nero for allowing me to use the translated article. 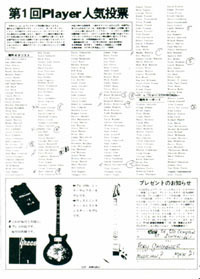 The original material was found and provided by Hideki Hoshi . Then Naoko asked Shinobu to translate it. With permission, I did some modification on the wording & reformatted the article to fit RoryON! !